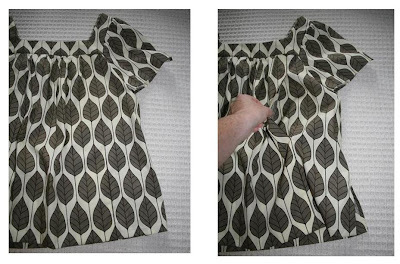 I've finally finished sewing my second garment of this year - this is slow sewing to the extreme! Which is fine if you are sewing couture garments that deserve slavish attention to detail, but not so when I'm just doing a simple skirt and desperately need some new clothes because my maternity clothes are way too big now (yay for me!) but my pre preggo clothes still do not quite fit (damn chocolate bullets I ate during my pregnancy). The fabric is a bit dark to get any details, but you get the idea. I topstitched the front pockets and pleats on the back with a dark orange thread like you see on most RTW jeans , so nothing unusual here. Of course the downside to such slow sewing is that I have lost weight in between cutting this out and finishing this, so I'll have to take it in somehow, maybe by putting a centre front and back seam in because with a side zipper and the rear vents it will be too much effort to take it all apart. Happily I've dropped 10kg of baby weight, but still have about 7 - 10kg of pregnancy comfort food weigh to get rid of, depending on whether I get to my pre-preggo weight or my ideal weight. But no real hurry I guess, it took 9 months to get that way so I'll have to be patient in getting rid of it especially when I'm so hungry due to breastfeeding. Hasn't it been a dramatic and extremely sad week in Australia this week? I'm sure you've all heard about the horrific bushfires in Victoria, the likes of which are unprecedented in Australia and just seem surreal to me. Terrible floods in far north Queensland, with a crocodile taking a little boy. And then there were two shark attacks in the last two days, one in Sydney Harbour and the other at Bondi and let me tell you as someone who used to swim in the sea every day as a youngster there's nothing scarier than being in the water when the shark alarm goes off. It feels like those dreams you have when you are being chased but are moving in slow motion: you just can't get out of the water fast enough. And I have managed to get some sewing done, probably because I'm only doing minimal housework in the rooms not affected by construction at the moment so I've had a bit of spare time in between naps. Also my husband does all the cooking and grocery shopping (I know, I'm extremely lucky) so I do manage to find time to do some things for me which is great for my sanity. Also thank god my mum is so calm and full of common sense, she always points me in the right direction as well as holding Anna whenever she's here which gives me a break. Well I have officially upgraded my birth experience from painful to traumatic: I spent most of last week back in hospital after suffering a post partum haemorrage due to some retained placenta. It was an extremely scary few days but it has all been resolved now without the need for a further operation (a D&C). On the bright side however, Anna and I got to stay in the airconditioned hospital during the hot weather Sydney has been having (I feel for you Vicki, Melbourne has been ever hotter) and whilst the hospital is pretty noisy what with those annoying buzzers going off every few seconds it had nothing on the noise my builders create around here so a few days bed rest in hospital wasn't a bad idea in the end. I really need some half decent breastfeeding clothes to wear out on the few occasions I do leave the construction zone that is my home, and while I did make a few dresses that are b/feeding friendly last year, I wanted to make some seperates that I could wear with pants and that would be ok for the rest of the year as well. For Elizabethe who is having her own baby in 5 months and expressed interest in seeing how I would modify patterns for b/f clothes (there's a challenge if I ever I heard one!) or for anyone else who wants ready access to their breasts (the mind boggles but you never know.....) I based this top on an Elizabeth Lee design. This pattern company are one of the few that do specific nursing patterns, and whilst I think the patterns use really clever techniques to enable access for nursing, the actual styles themselves aren't really me, so I decided to modify some patterns I already had inspired by these designs. And in exciting house news the works are nearly finished except for a little bit of wall lining and electrical work to do. Then we get to do the fun bits: painting, laying the flooring and setting up furniture. Well it's fun for me because all I have to do is pick out the colours and sit back while my husband and dad do the hard work LOL!